On this page, we learn the first step of this easy scrumptious pumpkin pie cake. This pie, one of our incredibly easy pumpkin recipes, is a crustless pumpkin pie and is a truly simple variation on a crustless baked cheesecake. 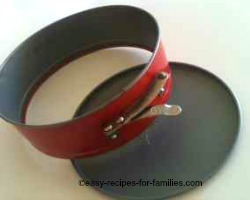 For the start of the tutorial and the full pie recipe, click here. 4 1/2 oz/ 125 grams of Graham Crackers or Digestive/Shredded Wheat Biscuits - these loosely textured, plain biscuits are soft and so, easily made into crumbs. This is a springform pan. Notice it is made of two parts - the base and removable circular wall. Notice the lever on the outside of the wall. You depress the lever to tighten the walls so that the base fits snugly against the springform walls. To remove your baked yummies, just release this lever and lift off the removable wall. Before starting, preheat the oven to 315F/ 160C. Turn the oven on now to allow sufficient time for all the air in the oven to be at the same temperature. Next, line the springform pan with a sheet of greaseproof baking paper. 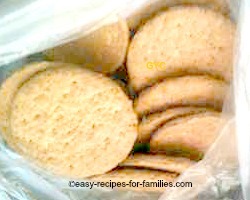 Place the crackers in the clean plastic freezer bag, ideally new and unused. Loosely knot the bag of crackers loosely after expelling as much air as you can. The bag should be secure but with ample room for the crumbs to move around. Crush them using the base of a heavy saucepan. It won't take long for these loosely textured crackers. 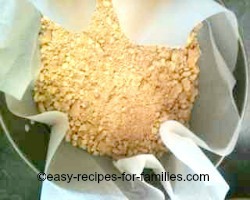 Keep crushing till the crumbs look very fine and evenly crushed. Unlike cheesecake recipes, for this particular recipe, don't fuss about getting the crumbs extremely fine and evenly tiny, as afterall this cake is a crustless pie. Crush them small but not necessarily fine. These crumbs make for a base but not a firm crust. Just tip all the crushed crackers into the lined springform pan. 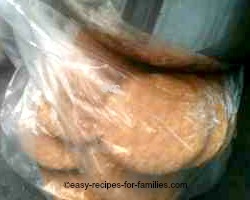 Spread the crushed crackers to the edges so that they are evenly spread on the base. That's it for this first stage. 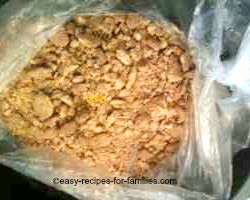 You've made laid the crushed cracker base for this pie cake and now, the next step is to make the pumpkin cake batter. 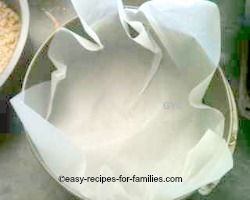 You will have to admit this step of the pumpkin pie cake is really easy! Please don't be tempted to avoid using the greaseproof paper to line the pan. Yes, I know what you're thinking - your pan is non-stick anyway, so why bother? This super easy recipe for a pie cake does NOT have a crust. So, the crushed cracker base is a loose mixture at the bottom of the pan and it is the cake batter that'll bind them. 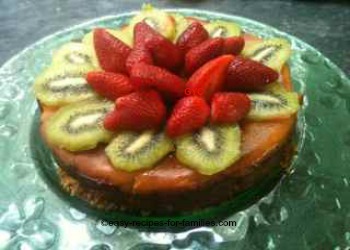 If you prefer a firm crumbed base please check out our easy cheesecake recipes. In these easy recipes, you'll find tutorials on how to make a crumb crust. 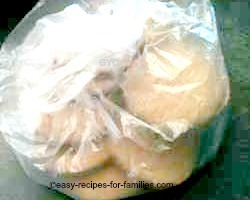 The baking paper is to contain the loose crushed crackers that have not bound to the cake batter. Leave Pumpkin Pie Cake and explore this site for more easy to make ideas for delicious pumpkin pie recipes.